Many home builders try to merge modern technologies with old-fashioned craftsmanship, but only a few are truly successful. Harmoniously combining hand-forged ironwork and traditional handcrafted surface treatments with recycled construction materials and today’s environmentally sensitive construction methods—all on a small footprint— can intimidate even the most experienced architects and building firms. 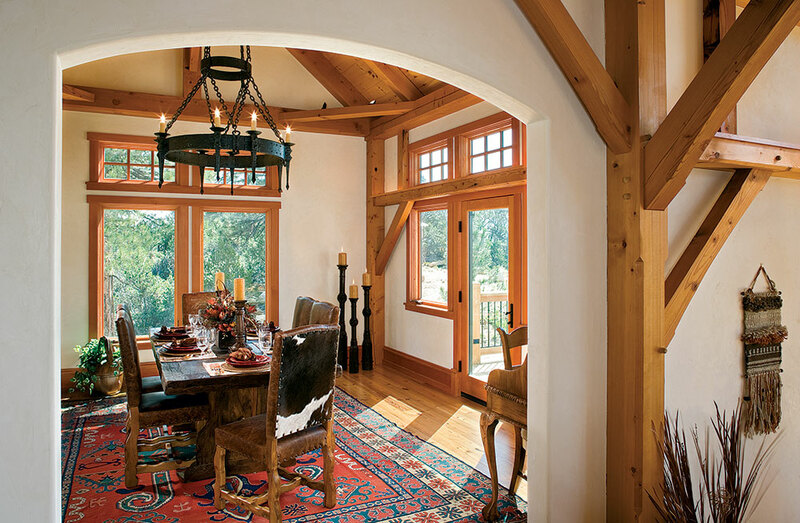 However, on a Colorado site featuring some of America’s most scenic vistas, Bensonwood Homes created a home that perfectly combines the best of the old with the best of the new. The homeowner “wanted to build a small but magnificent custom home atop a bluff on a seven-acre property in Colorado,” says Randall Walter, the home’s architect. Located in the southwest corner of the state, midway between the towns of Montrose and Telluride, the home site looked out over an unspoiled valley dotted with scenic cattle ranches. Randall was assisted in the planning process by Colorado builder Duane Beamer and craftsman Ted Moews, both of whom had worked with Bensonwood Homes on previous projects. After five months of brainstorming, they created a plan they believed met the homeowner’s needs while taking full advantage of the glorious location. The home’s final blueprints featured just a bit less than 2,000 square feet of single-story living space. Despite the relatively small footprint, the home includes a dramatic great room, a country kitchen, a separate dining room, a cozy master suite, a guest bedroom, and a bonus loft area. Space for a laundry room and garage were found on the lower level under the two bedrooms. Using timbers salvaged from a Washington-state sawmill built in the 1920s, Bensonwood began frame construction in its New Hampshire factory in winter 2006. The company uses a system it calls Open-Built for every project it builds. Open-Built standardizes design limits, but allows designers to work collaboratively and use a computer database of design elements from previous structures for use in new designs. Once the home plans are finalized, machines are programmed to manufacture and assemble components. Standardizing design and construction elements makes homebuilding more precise, more affordable and more efficient. As a result, on this project, the timber-frame shell, roof and wall panels were on site by the spring building season. It then took less than a week to enclose the entire house. “The house is perfectly situated with open-plan rooms carefully aligned to take advantage of passive solar energy,” Randall says. “More than 80 percent of the south-facing elevation is glass.” To prevent floor-to-ceiling glass walls from looking too modern, old-fashioned multi-pane transoms are used to accent energy-efficient picture windows. To reduce overheating, the roof’s overhangs are engineered to the site’s specific sun patterns. A front vestibule acts as a buffer zone. “Everything in the home is designed to reflect the rustic way of life that is rapidly vanishing in the West today,” explains Randall, the architect. Time-tested craftsmanship is celebrated everywhere, from the whittled carving on the weathered-wood front door to the rugged blacksmith-forged hardware and massive hand-hammered iron chandeliers. One of the home’s defining features is a freestanding Rumford-style fireplace, sheathed in reclaimed brick from the 1880s. Rumford fireplaces were the state-of-the art of fireplace design at the time of the American revolution, featuring tall classic elegance and heating efficiency. The fireplace is a focal point from the entry foyer, great room and kitchen. In addition, it gives the homeowner and guests the opportunity to cook on a wood-burning fire on the backside. The home’s ode to the Old West continues in the kitchen with a sandstone lentil, or ledge, built under the curved bread oven, Mission cabinetry and sun-baked Saltillo floor tiles. A reproduction Arts and Crafts Pine Panel Mural backsplash, originally created by West Coast ceramic designer Ernst Batchelder in the 1920s, features individually handmade tiles. 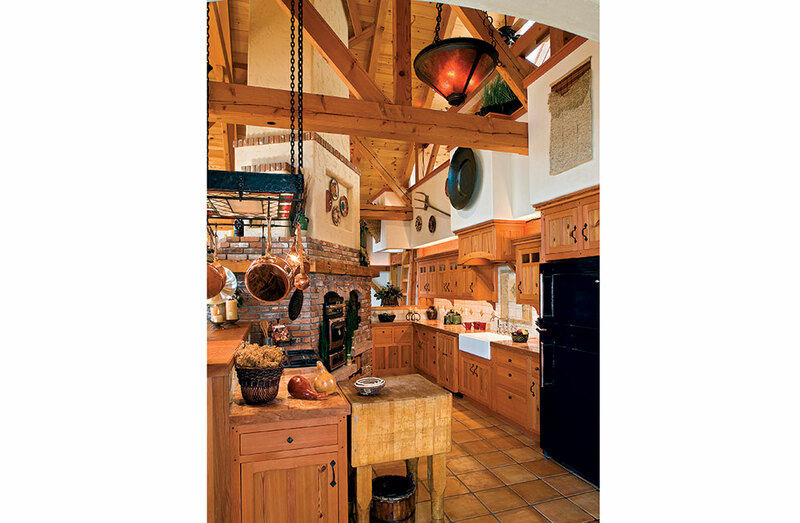 A hand-wrought, hand-hammered iron pot rack hangs above the cooktop. The frontier iron artistry, designed by Ted Moews and produced by master blacksmiths in North Carolina, Wisconsin and Colorado, can be found throughout the house. 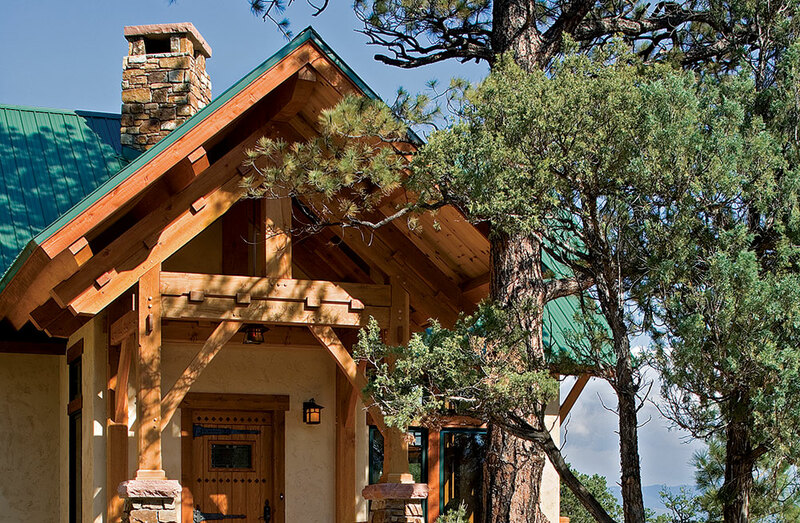 The façade’s exposed timbers, pale stucco finish and green metal roofing look right at home with the area’s rocky terrain and mature Ponderosa pines. Strategically sized overhangs are an essential part of the home’s passive solar strategy. Narrow ranch benches are the opening notes in an ode to the Old West that begins at the front entrance. 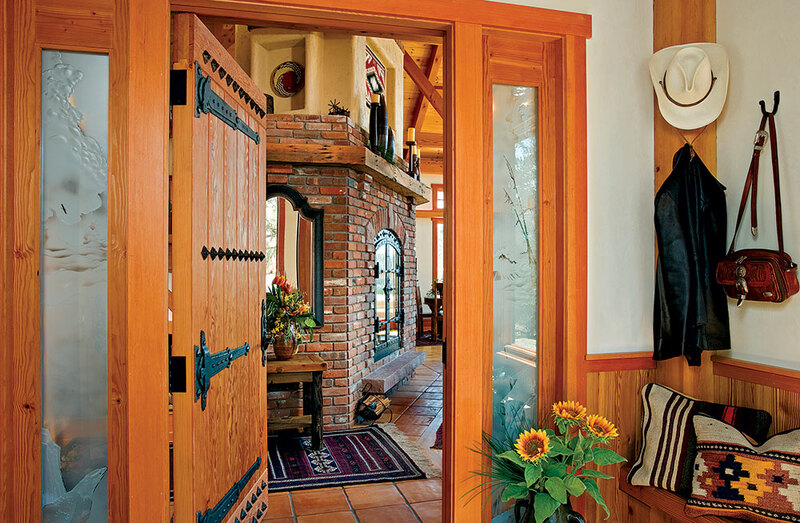 The western motif continues with a weathered plank door studded with clavos (pyramid-shaped iron screws) and the foyer’s sun-baked Mexican Saltillo floor tiles. 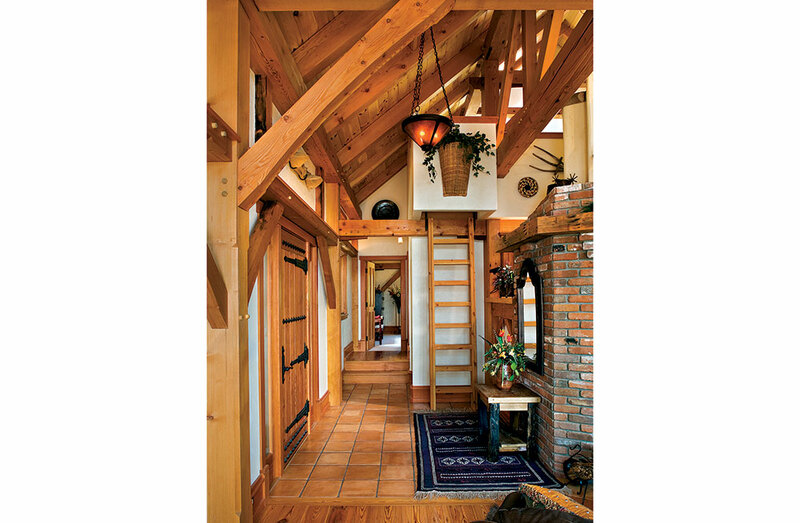 A ladder in the front entry hall leads to an airy loft overlooking the great room and kitchen and offers a closer look at the traditional mortise-and-tenon joinery secured with oak pegs and cherry splines. Radiating from the entry area’s tiles, southern yellow pine, reclaimed from an 1840s mill in New Hampshire, adds a warm glow. 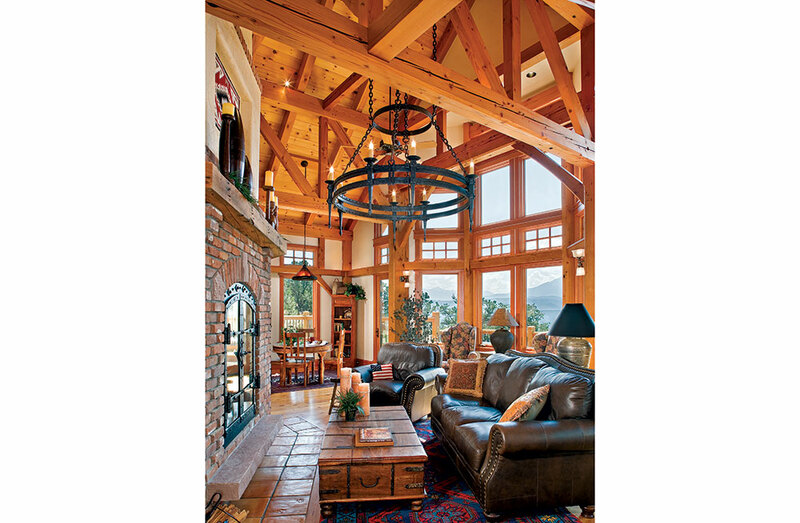 Exquisite timber-frame architecture defines the great room’s soaring 28-foot cathedral ceiling. A forged-iron chandelier with electric candles and Mission-style sconces harken back to the days when paraffin wax and gas provided homes with soft illumination. An open floor plan draws in light from the great room to keep the kitchen feeling bright and airy. A combination stained glass fixture/pot rack provides task lighting for the cooktop and multi-level island. The sleek granite counters serve as a pleasant contrast to the kitchen’s rough-brick hearth and craggy clay floor tiles. Large expanses of glass and a door that opens onto the wrap-around deck create the illusion that the dining room is larger than its modest square footage. Family and friends share sightings of deer, elk, eagles and wild turkeys while gathered around a trestle table. Cowhide chairs add a rustic touch. Berry red bed linens add a pop of color to the master bedroom. Rope lights accent a display ledge above his and hers closets separated by a built-in media center. 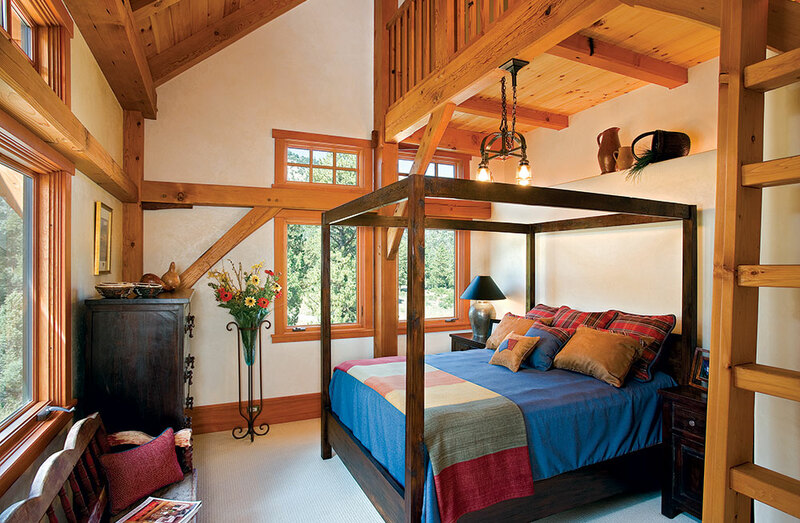 Dark wood furnishings and an antique Mexican painted bench stand out against the honey-hued Douglas-fir framing, tongue-and-groove ceiling and overhanging loft. Australian merino carpeting by Godfrey Hirst lends the floor luxurious softness. Golden marble tiles top the master bath’s vanity while the floor, walk-in shower and whirlpool-tub surround are finished with tumbled travertine stone. 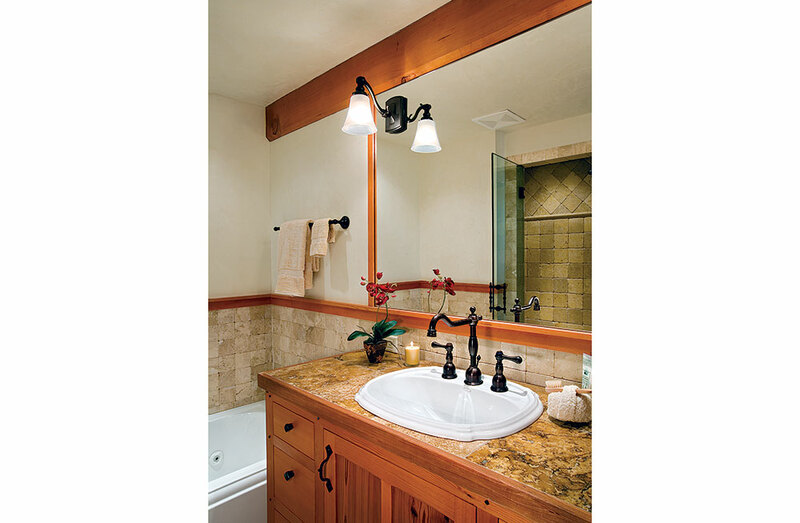 A European style steam shower and Kohler’s Portrait Series fixtures are enhanced with bronze faucets that complement the hand-forged cabinet hardware. 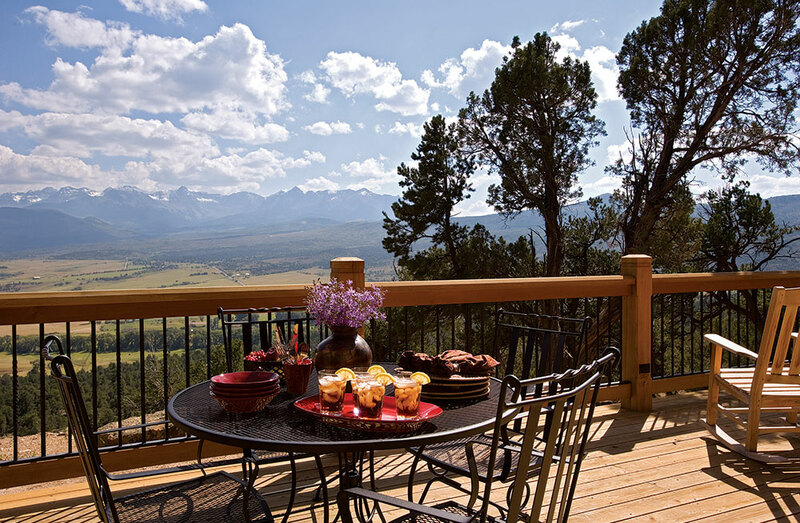 Hand-forged iron balusters fitted into Douglas fir railings offer an unobstructed view of Colorado’s Pleasant Valley and the snow-capped San Juan mountains. To facilitate after-dark entertaining, low voltage lighting at the base of the posts casts a soft glow on the redwood deck.